With two games remaining in the regular season, the stage was set for the Thunderbirds men’s soccer team to clinch the top spot in the Pacific Division. Needing just one win to achieve the feat, the ’Birds hosted a desperate UBC Okanagan Heat (UBCO) on Friday evening. 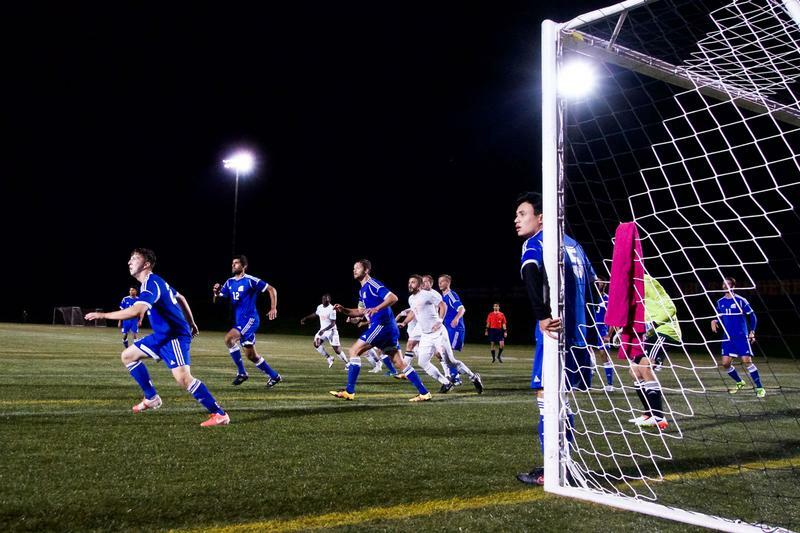 After a grueling 90 minutes, it was UBC who walked off the field with the three points and first place in the division. Both teams seemed eager to create chances early on in the match, as the plays went back and forth across the length of the pitch. After playing a third of the first half, the Thunderbirds were beginning to gain control of the game, creating chances on a regular basis. In the 26th minute, UBC’s Chris Damian showed a bit of flair to pass the ball to Manpal Brar, who missed the target on a good opportunity. Eight minutes later, Jules Chopin created some space for himself to fire a shot from outside the box, which was just wide of the net. There were many shots from the T-Birds, but most of them were off-target. Despite a scoreless first half, the intensity between the two teams was clearly visible. The Thunderbirds remained defensively sound in the entire half. The second half showed a bit more intensity as players were beginning to execute their passes and shots accurately. It is safe to say that UBC got on the right foot early in the second half and did not lose any momentum. Some early pressure in the second half from the Thunderbirds was highlighted by a 57th minute free-kick taken by T-Bird midfielder Karn Phagura from 40 yards, which dropped right into the feet of Bryan Fong, who drove the ball straight into UBCO keeper Mitch McCaw’s path. There was only one dangerous moment for the Thunderbirds’ defense in the second half, which came in the 76th minute. Heat forward Luke Warkentin tipped the ball over Thunderbirds’ keeper Chad Bush, but his attempt was cleared by UBC defender Manraj Bains. Time was running out for UBC to score a goal, and they made one last substitution with 12 minutes remaining. Jules Chopin was replaced by Ryan Arthur in hopes to salvage a win in the late stages of the game. Finally, after 90 minutes, the Thunderbirds were rewarded for their efforts in the added time of the second half. Titouan Chopin lured the Heat’s defense in the dying seconds of the game and passed the ball onto the feet of Arthur. Arthur took a gamble with his left foot from the top of the 18-yard box, and saw the ball glide past the goalie and into the top left shelf. “It’s a big one — it clinched us first place ... Everything came together nicely,” said Arthur of his first goal of the season. The celebrations did not stop after Friday night’s game, as the Thunderbirds went on to beat the Thompson Rivers University Wolfpack the next day. Ryan Arthur scored the opening goal of the match for the second straight day and the Thunderbirds went on to win the match 2-1. UBC walk into the playoffs in style, finishing the regular season as Pacific Division leaders.